"How to get rid of termites" is a question most people hope they never need to ask. However, in the U.S. termites cause about $30 billion in damage to homes, businesses and crops. Compare this to an annual $11.7 billion in damage caused by fires, and termites beat fires by a factor of almost 3 times! A homeowner can expect to spend an average of $3,000 in termite damage repair. So, "how to get rid of termites" is a question many home owners and business owners should prepare to face. This site is designed to give a quick and informative summary for those experiencing a problem with termites. Termites: How do you know if you have them? The first most obvious indication of termites is the type of damage you see in the wooden structure they are attacking. Termites totally destroy wood until it literally crumbles, whether it is wooden siding on your home, or wooden support beams. Termites have been known to literally take down an entire building! The upper right image is termite damage. Termites eat wood. The left image immediately above is carpenter ant damage. Carpenter ants make galleries in wood for their home, but do not eat wood. Therefore termites are far more destructive to wooden structures. Other indications of a termite infestation: You might see a swarm of winged insects on your in your home, often on a windowsill. This is the reproductive form of termite. They drop their wings, then look for a place to build a nest. You might also note mud tunneling under your home or near the foundation. This is a definite sign of a subterranean termite infestation. 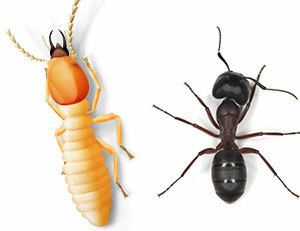 Termites and carpententer ants are often confused, since they have a similar appearance. Yet, termites and carpenter ants have radically different feeding habits. "How to get rid of termites" is a very different approach from "how to get rid of carpenter ants" Therefore, as a starting point, it's of crucial importance to know whether you're dealing with termites or carpenter ants. The termite is on the left, the carpenter ant is on the right. Yes, they look very different in this close-up picture, but are still often confused! Probably because some carpenter ants are lighter in color, some termites darker. What are the different features? Notice the carpenter ant's antennae are bent, and the body is in well defined sections. How Did The Termites Get There? The most common way termites get into a home is by flying in from a nearby colony (located in another home or a dead rotting tree) during their reproductive stage. Subterranean termites, the most common variety in the Northeastern U.S., are attracted to damp wood, so if you have a water leak in your gutter, roof, plumbing or foundation, you're inviting both termites and carpenter ants into your home. Make sure the wooden structure and siding of your home is completely dry. No damp wood. Seal up any openings including cracks in the foundation, siding, roof, window frames and door frames. Keep any wood stored in or near your home completely dry and out of direct contact with the soil. Inspect the area around your home for dead rotting trees or shrubs. Remove these completely off your property. Always create a space between any plantings and your home so that no plantings are coming into direct contact with your home. There are termiticides available, but these are toxic to humans and pets, and may require a license to administer. It's best to hire a professional to safely apply a termiticide. You'll want to locate every termite colony in or near your home. 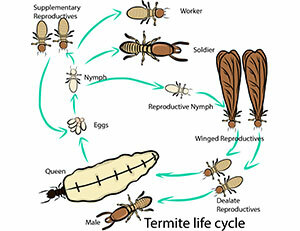 This also may require an experienced licensed professional termite exterminator who is an expert at the detective work of locating termite colonies. Repair all termite damage to your home or business. Termite damage untreated may invite the return or termites, and can compromise the structural integrity of your home or business. To ensure the safety of you, your family and your employees and clients (if you conduct business in the building), we strongly recommend you contact ApolloX Pest Control to professionally, safely and effectively eradicate a termite problem. We'll inspect your entire building for further signs of termite infestation so that we're sure the problem is completely eliminated. We'll report on any damage to your structure so that you can make necessary repairs. Finally, we'll check your property for the presence of termite colonies that could migrate to your home. 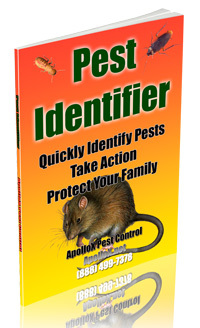 ApolloX Pest Control Has The Skill, Experience and Equipment to Get Rid of Termites! Do you think you have a termite problem? Don't wait until they further multiply. Don't wait until the termite-damaged foundational support of your home begins to crumble!